Major works will begin in Tullamore on Wednesday, January 2 with diversions being put in place as High Street becomes one way. Work on the Tullamore Public Realm Enhancement is expected to last for six months. The project includes improvement works to High St, Bridge St, Columcille St, Millennium Square and O’Connor Square. The works to High Street and Bridge Street will involve the undergrounding of the existing overhead wires together with the removal of existing poles. The existing street lighting will be replaced with new feature light poles. The existing footpath will be replaced and widened at particular locations. Road reconstruction and surfacing will also be undertaken on a phased basis. This map shows the traffic management system that will be in place. 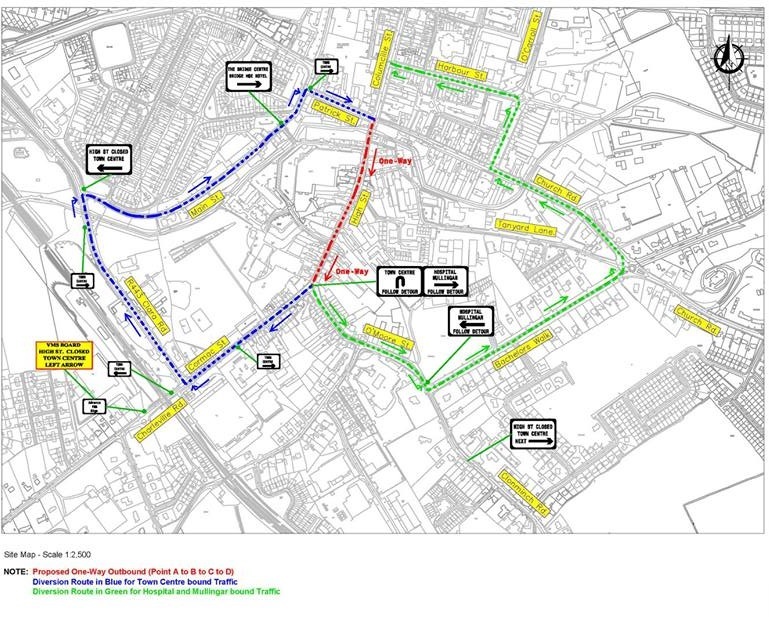 High Street will be on way outbound for the duration of the works with traffic approaching the town centre being diverted via Kilcruttin and along Main Street before turning on to Patrick Street. Traffic heading for the hospital and Mullingar will be diverted at the top of High Street along O'Moore Street and down the New Road before turning on to the Church Road. As the works progress, other traffic management systems will be put in place.